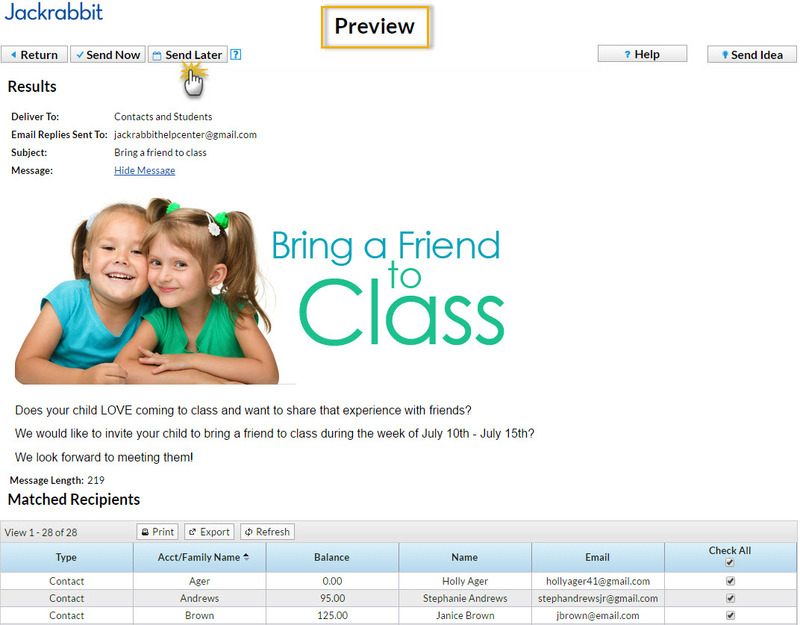 Emails can be scheduled up to 90 days in the future using the Send Later button on the email Preview screen. 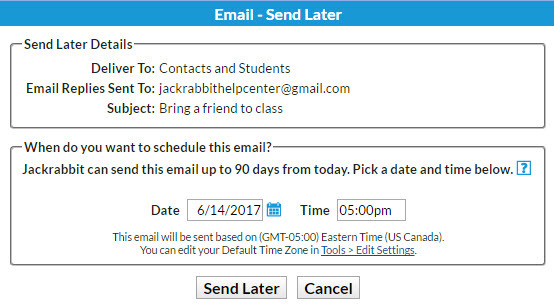 When you preview an email that was created in Jackrabbit, you have the option to send the email immediately or schedule the email to be sent at a later date/time. The recipient list for the scheduled email is generated and attached to the email based on the search criteria used on the date you create the email. An email scheduled to be sent on a future date will only include recipients that matched your selection criteria at the time you created the email. It is not updated, prior to being sent, to include any students who enrolled after you created the email, nor will it exclude any students who may have dropped since that date. Compose your email (for example from Families > Email/Text Families). Using the various search criteria, choose who the email is being sent to. Clear the check box for any email address you don't want to receive the email. Select the Date and Time you want the email to be sent. Note: The email will be sent based on the Time Zone designated in Tools > Edit Settings > Time Date Settings. You will receive a confirmation that your email has been scheduled.